^ Dean, Jason (August 11, 2007). "The Forbidden City of Terry Gou". The Wall Street Journal. 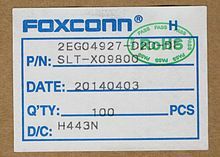 ^ "Suicides at Foxconn: Light and Death". The Economist. 2010-05-27. ^ "Struggle for Foxconn Girl Who Wanted To Die". Mimi Lau in Wuhan, Hubei. South China Morning Post. 2010-12-15. ^ "About Foxconn: Group Profile" Archived 2011年5月18日, at the Wayback Machine.. Foxconn Technology Group. ^ "Foxconn: Arson at Mexico Plant Work of Angry Ex-Employee". PC World. 2010-02-22. ^ "Citigroup Likes Hon Hai's Purchase of Set-Top Box Plant". Taipei Times. 2011-07-20. ^ "Foxconn Denies Plans To Acquire Sony LCD TV Factory in Spain". Ninelu Tu; Adam Hwang. DigiTimes. 2010-07-09.